30-31 October 2019: International conference "Architecture and Bureaucracy: Entangled Sites of Knowledge Production and Exchange"
From 9-13 July 2018 the Sixth International Congress on Construction History will be organised in Brussels, following previous editions in Chicago (2015), Paris (2012), Cottbus (2009), Cambridge (2006) and Madrid (2003). Over 170 international scholars will present the latest research in the field of construction history. This 5 days congress aims at favoring the share of knowledge at an international level and critically discussing future trends in research on construction history. On Wednesday July 11, guided tours to interesting buildings, structures, building sites, archives, etc. throughout Belgium are organised, discover them at www.6icch.org. 6ICCH is THE event of 2018 for architects, building conservators, historians, engineers, contractors and other professionals involved or interested in the field of construction history. Don't miss out on it and register now at www.6icch.org. The interdisciplinary research team ‘Building Brussels’ kindly invites you for its official kick-off meeting on friday June 9th 2017. Building Brussels is a VUB-funded research project that investigates the role of SMEs in Brussels’ urban fabric, with a particular interest in the construction sector. In order to fundamentally grasp its specificity, the research will intertwine multiple disciplines: construction history, urban planning, architectural engineering and business history. Seen its societal relevance, we warmly invite you as a stakeholder to participate in the event and the debate. Séminaire organisé par le Laboratoire de médiévistique occidentale de Paris(LAMOP) UMR 8589, CNRS - Université Paris 1 Panthéon-Sorbonne, le Centre de théorie et analyse du droit (CTAD) UMR 7074, CNRS - Université Paris Ouest Nanterre La Défense etlLe Laboratoire Archéologie et Philologie d’Orient et d’Occident (UMR 8546, ENS-CNRS-EPHE), avec le soutien du laboratoire d’excellence TransferS. The 6th International Congress on Construction History (6 ICCH) will be organised in Brussels, from July 9 to 13, 2018. The congress follows on successful congresses held in Madrid (2003), Cambridge UK (2006), Cottbus (2009), Paris (2012) and Chicago (2015). The call for abstracts is open! We invite researchers and practitioners from all aspects of the history of construction to submit a 400-word abstract before June 15, 2017. More information on the open and thematic sessions and the submission procedure can be found on www.6icch.org. If your abstract is selected for a paper presentation at the congress, you will be notified by September 15, 2017. The deadline to submit full papers is December 1, 2017. Papers presented at the congress will be published in proceedings available at the congress. All papers and presentations must be in English. If you have questions related to this procedure or if you experience any problems in submitting your abstract, please contact the congress secretariat at info@6icch.org. The 6th International Congress on Construction History (http://6icch.org) will be organized in Brussels, from July 9 to July 13, 2018. For the first time, we will organise thematic sessions as well as the usual open ones. Today we launch the call for sessions (see attachment) and we are looking forward to receive your proposals by April 1, 2017. Please circulate this call among your colleagues and broader network. Lecture by Manuela Martini : For a small scale history of construction industry. A discussion about: Manuela Martini, Bâtiment en famille. Migrations et petite entreprise en banlieue parisienne au XXe siècle (CNRS éditions). CHARRUADAS P., FRAITURE P., GAUTIER P., PIAVAUX M., et SOSNOWSKA P., 2016, Between carpentry and joinery: Wood finishing work in European medieval and modern architecture (Scientia Artis, 12), Peeters : Herent, 271 p.
From the examination of the historiography of finishing work in wood for architecture from the medieval to modern period, it is clear that this field of research is the poor relation of historical and archaeological studies, with the lion’s share focusing on the structural work of carpentry. It is on the basis of this observation that the present work has been produced, which results from a conference held in Brussels in 2013. The work demonstrates first the real interest in an approach to finishing work for the study of ancient buildings and the establishment of a precise chronology for their phases of layout as well as in obtaining better understanding of material cultures and ways of living. Second, it reiterates that the limit between carpentry and joinery was often porous, sometimes artificial. 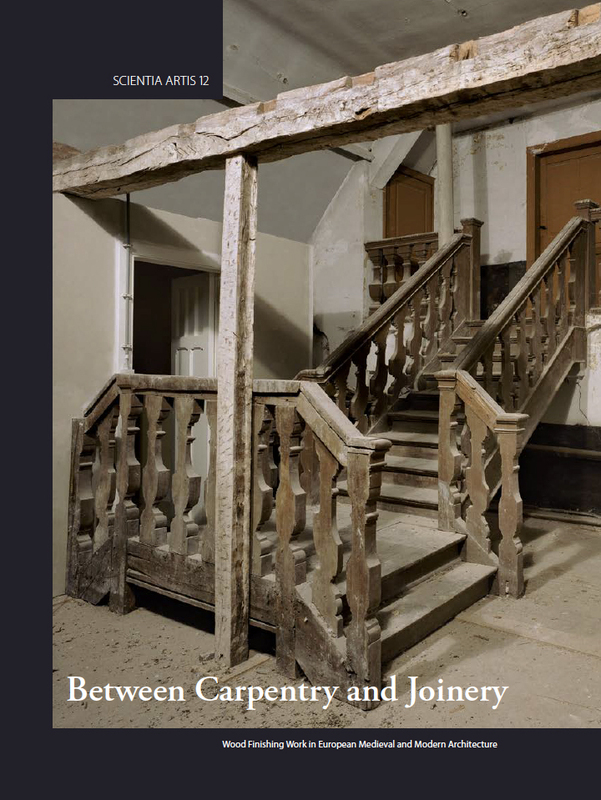 Finally, the work stresses that an overall approach to the use of wood is crucial to comprehensively address the organisation of a building, the logic of its construction and its ‘utilisation’, and more generally, the complex history of the buildings studied. This work, which thus represents a first step toward an overall approach of ‘wood material’ in European architecture, includes thirteen contributions divided into two thematic sections in keeping with current research practices. The first addresses the divide between structural and finishing work via the question of flooring, ceiling and roofing techniques. The second focuses intrinsically on finishing work by examining the contribution of this craft domain to the organisation, comfort and ornamentation of houses. The Research Centre in Archaeology and Heritage of the free University of Brussels has set up an archaeological inventory project focussing on the study of cellars in the Brussels region. Started in in January 2017, this innovative project in urban archaeology will analyse in detail the remaining underground heritage of the city on a large scale. The project will be executed in partnership with the services of the monuments and sites directorate and the city of Brussels and the funding of the Brussels-Capital Region. Linsy Raaffels, Master of Science in Architectural Engineering (ULB-VUB Bruface, 2016), is granted an INNOVIRIS-Doctiris. With these grants Innoviris aspires to stimulate collaboration between the academic and industrial/professional world in the Brussels Capital Region. The research “Architects’ houses in Brussels. Strategies for valorization” will focus on 19th and 20th-century architects’ houses in Brussels and examine how these architects’ houses evolved over time and how to valorize them in a qualitative way for the future. Linsy Raaffels will define the characteristics and qualities of architects’ houses in the Brussels Capital Region and elaborate strategies for qualitative restoration and renovation projects under the supervision of prof. dr. Inge Bertels and prof. dr. Stephanie Van de Voorde (VUB, department of Architectural Engineering), and in collaboration with Barbara Van der Wee Architects. Moreover, she will valorize this part of the Brussels patrimony through various media to the broader public by means of for instance best practices, new restoration techniques and recommendations for experts, such as architects, as well as for owners and other stakeholders. Vacancy Phd-position 100%. Interdisciplinary Research Project Building Brussels. The Interdisciplinary Research team Building Brussels seeks for a full-time PhD-researcher. He/she will study the historical evolution and viability of small and medium enterprises in the Brussels building sector. Please find enclosed the vacancy text. Subsequent to her master thesis, Linsy will continue her research on architects’ houses from January onwards through a PhD under the supervision of Prof. dr. Inge Bertels en Prof. dr. Stephanie Van de Voorde. The project: Architects’ houses in Brussels: Strategies for valorization, will be a collaboration between VUB ARCH and Barbara Van Der Wee Architecten. Dans la cadre du colloque Beton vor dem Stahlbeton qui se tiendra à l’École Polytechnique fédérale de Zürich, Bernard Espion donnera une conférence intitulée : Le système d’armature Hennebique. Développement et applications en Belgique. Considérations sur son efficacité. Dans la cadre de la première journée d’étude GSA à l’INSA de Paris-Malaquais, Bernard Espion donnera une conférence intitulée : Le système d’armature Hennebique. Développement et applications en Belgique. Considérations sur son efficacité. Quatrième journée sur l’usage du fer dans la construction organisée par le Fabi : Les structures mixtes : « Fer et … » au XIXe et au début du XXe siècle. Dans le cadre du séminaire international du CReA-Patrimoine "Les atteintes à l’encontre du patrimoine au travers de l’histoire : perspective(s) archéologique(s) et enjeux actuels", Philippe Sosnowska (CReA-Patrimoine, Université libre de Bruxelles) donnera une conférence intitulée "Combusta integrior exsurgo… Bruxelles et son bombardement en 1695. Du désastre à sa reconstruction. Apport de l’archéologie à l’étude d’un événement majeur de l’histoire bruxelloise". Dear colleagues and students, On Thursday 27th of October our current Brussels Centre for Urban Studies (BCUS) visiting research fellow prof. dr. Sara Wermiel will lecture and discuss with our master students on the ‘Historic Preservation Movement in the U.S.: from ownership to regulation’. Colleagues and students interested in the topic are welcome to participate. Her lecture will cover the early history of the preservation movement in the United States, including how changes in understanding of property rights and what constitutes heritage, and the impact of extensive urban renewal and highway programs after World War II, have shaped the preservation framework of today. There are parallels between U.S. history and that of countries in Western Europe. Sara Wermiel is an independent scholar who lives in Boston, Massachusetts, USA. She completed her PhD at the Massachusetts Institute of Technology in the fields of Urban Studies & Planning and History of Technology. As a BCUS visiting research fellow, Sara will study the regulations, incentives, and citizen initiatives aimed at preserving historic properties and districts in the Brussels region, and compare these with practices in the Boston (Massachusetts) region. Public lecture by Inge Bertels on the architectural and construction history of the Antwerp Central Station by Inge Bertels: 'Antwerpen Centraal: van dompige barak tot spoorwegkathedraal'. International Workshop "Destroying Archaeological Heritage in Time of Conflicts Crossed Perspectives"
Conférence inaugurale par Bert Smith (Université d’Oxford) "Care of the Past: Buildings and statues at Aphrodisias in later antiquity and after"
Les conférences suivantes se donneront le lundi de 14.00 à 16.00 dans le local AY2.112. Lecture by Quentin Collette & Ine Wouters, "A riveting story: development of the hot-riveting technique in iron and steel construction (1840-1940)"
Research seminar "Building Contractors and their Entrepreneurial Strategies"
Lecture by Valérie Nègre (École nationale supérieure d'architecture de Paris la Villette), "Les architectes, les artisans et la technique au tournant des XVIIIe et XIXe siècles"
"Les métaux ferreux dans la construction. De l’entrée dans l’ère de l’acier à la Première Guerre Mondiale", troisième demi-journée du cycle d'étude sur le thème "Les métaux ferreux dans la construction. Des origines au milieu du 20ème siècle"
"Les métaux ferreux dans la construction : de la Révolution industrielle à l’entrée dans l’ère de l’acier", deuxième demi-journée du cycle d'étude sur le thème "Les métaux ferreux dans la construction. Des origines au milieu du 20ème siècle"
"Le fer dans la construction avant l’ère industrielle", première demi-journée du cycle d'étude sur le thème "Les métaux ferreux dans la construction. Des origines au milieu du 20ème siècle"